While birding southern California last month I was able to study some interesting closely-related taxa. Below are some side-by-side comparisons with a few of my better digiscoped photos. Note: ALL photos below were taken during the month of February ("Belding's" Savannah Sparrow from Feb 2010 and the rest from Feb 2011). Click to enlarge. 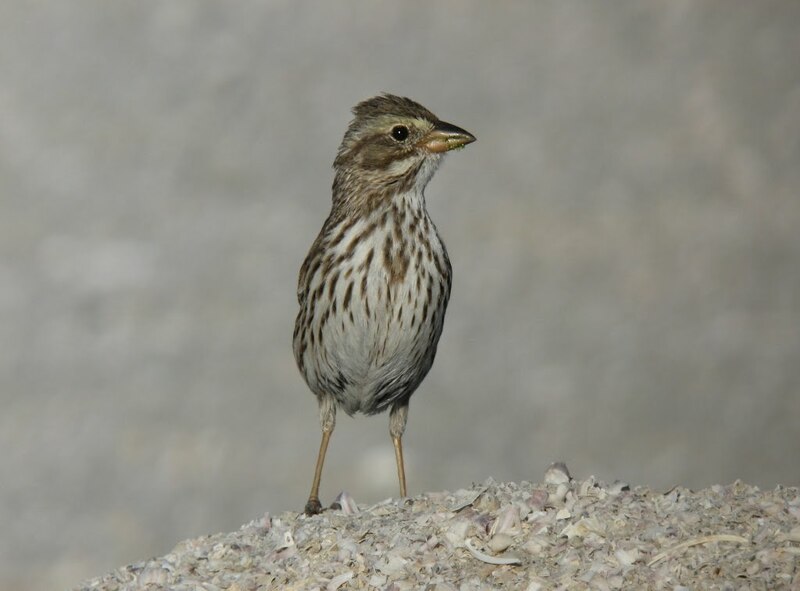 Sage Sparrow is comprised of several subspecies, often divided into the two groups "Bell's" and "Interior." 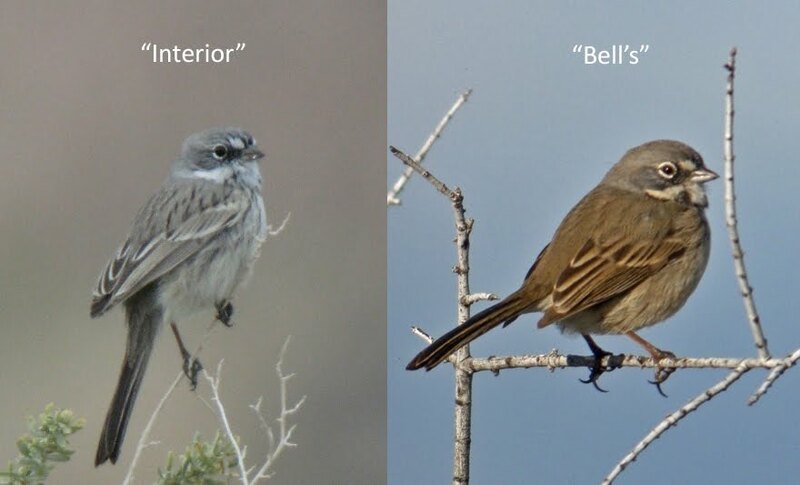 "Bell's" is the largely-resident coastal Pacific group while "Interior" birds are widespread between the Rocky Mountains and California. Multiple subspecies make up the "Interior" group, the most widespread of which is the migratory nevadensis, which is a migrant and winter visitor to southern California and is likely the subspecies photographed here. The Interior group is paler overall, with a rather pale gray head, weak lateral throat stripes, and dark streaking on a pale brown back. This color scheme blends in with the pale sagebrush habitats they prefer. 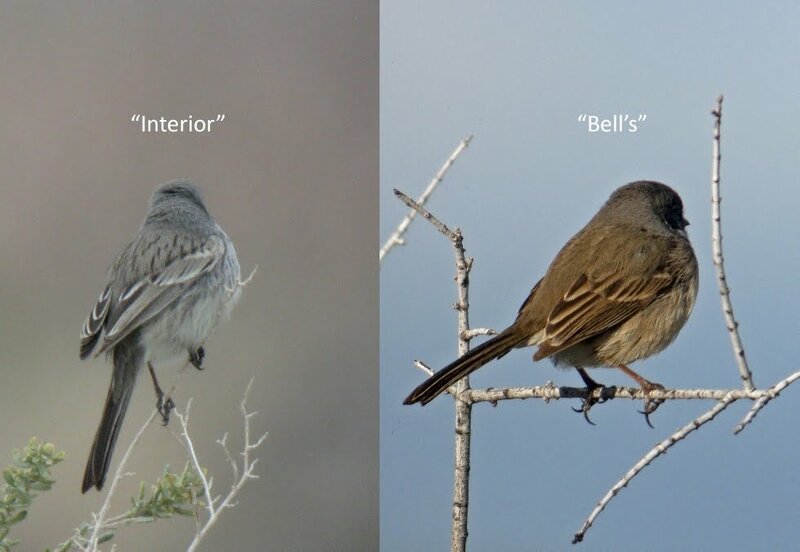 Bell's is darker, showing a medium-gray head, dark and distinct lateral throat stripes, and a darker brown back that is quite uniform with very indistinct streaking. The darker head on Bell's allows for its white eye-ring to jump out even more. Savannah Sparrow has recently become one of the more interesting taxonomic subjects in the birding world. At the center of the debate are the two subspecies depicted above. Belding's are a resident subspecies of southern California's coastal marshes. 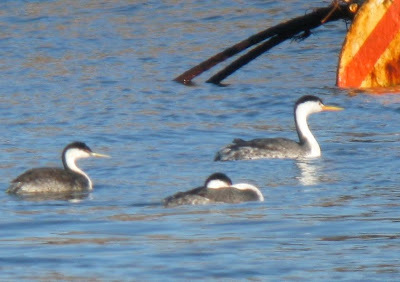 As opposed to the Large-billeds and nominate "Northern" birds seen on this trip, Belding's were actively singing on territory in mid-February. These are dark and heavily-streaked birds, particularly along the flanks. Bill shape as compared to Large-billed is proportionally longer and thinner. 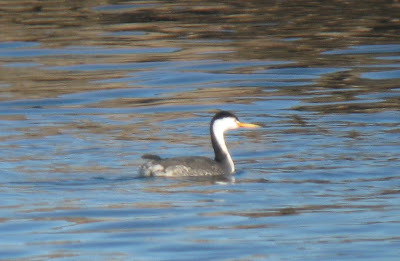 To my eyes the head/bill GISS appeared somewhat Ammodramus-like, owing to that bill shape and possibly flatter crown. Large-billed breeds in Baja but disperses in several directions during winter, including north to southern California. The most reliable winter location in CA is along the shores of the Salton Sea. Its most obvious feature is that big honkin' bill with a clearly curved culmen. Otherwise, the plumage is of rather low contrast. The upperparts, at least of these birds in February, were a plain gray-brown. I've read that they look somewhat House Finch-like which I can see in terms of the overall bland plumage. I had to look closely to notice the yellow in the supraloral on the two Large-billeds I saw at close range. Another taxonomic conundrum, the Scrub-Jays have undergone some changes in recent years, and more change may be in the cards. 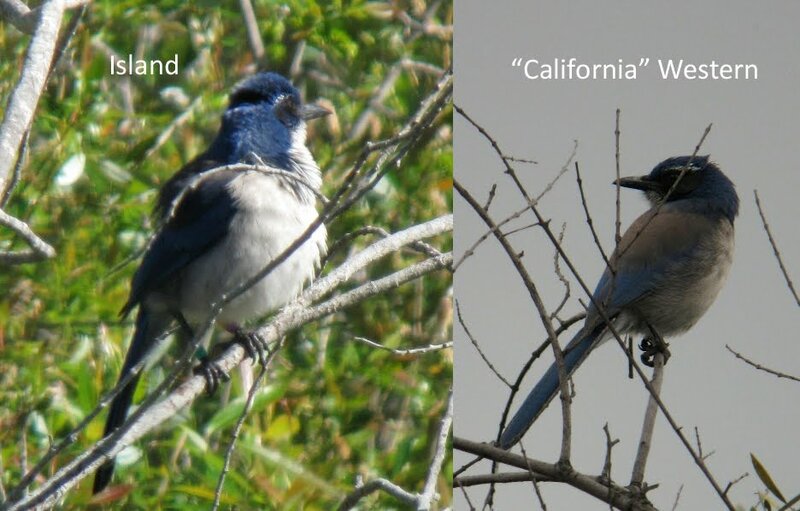 Not too long ago we had only one Scrub Jay species, but a split in 1995 created the Island Scrub-Jay, Western Scrub-Jay, and Florida Scrub-Jay. The Island Scrub-Jay is endemic to Santa Cruz Island off southern California. Florida Scrub-Jay is endemic to, you guessed it, Florida. Recently there has been talk of splitting Western Scrub-Jay into their "Woodhouse's" (AKA Interior West) and "California" (AKA Pacific) forms. These photos are not the greatest and were taken in a variety of lighting conditions making comparison difficult. However a few differences are still apparent, notably the more substantial bill and darker/more intense blue color of the beefier Island Scrub-Jay. The white eyebrow of the Island Scrub-Jay is also noticeably thinner and less striking. David Sibley notes more subtle differences between the two forms in a thorough article on his blog. Another closely-related pair, these two species were split from one another in 1985. They can present identification nightmares, particularly distant birds in basic plumage. Out-of-range individuals can make things even worse if observers have little experience with the species pair. I was fortunate enough to locate a small flock of Aechmorphorus grebes fairly close to shore in Ventura Harbor, allowing for a great side-by-side comparison between one Clark's and a handful of Westerns. This is a nice, easy case (they can be much trickier!). 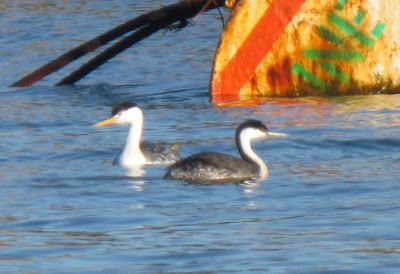 Immediately apparent are the Clark's Grebe's bright orange-yellow bill and eye that is almost entirely surrounded by white. The Western Grebes all showed dull green-yellow bills and eyes entirely surrounded by dusky feathering. Also, while not the best photo set to show this, the dark stripe down the back of the neck is thinner on Clark's versus Western. 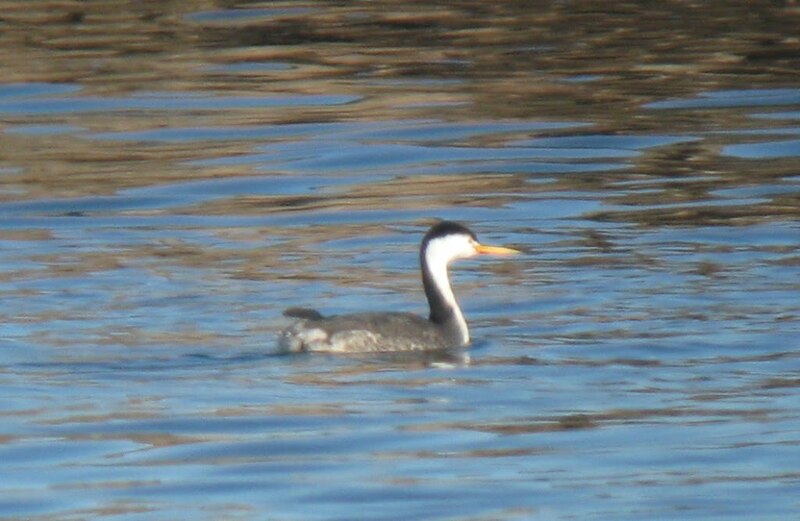 Clark's Grebe averages paler upperparts (particularly flanks) than Western, which can be seen in the photos above. 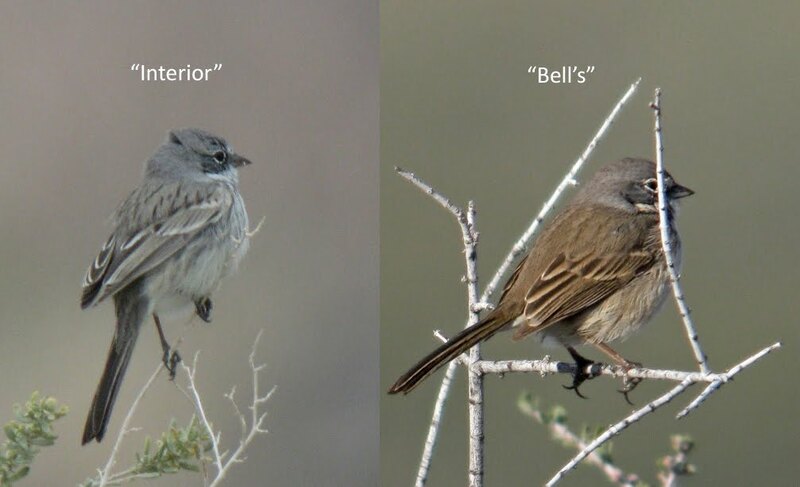 Although the subspecies depicted here look quite different, the California subspecies of the interior group canescens actually looks much more similar to the coastal "Bell's" group than it does to nevadensis. I'm not totally sure of the rationale for grouping canescens with nevadensis. Thanks Ben, great stuff. I left canescens (and other Sage Sparrow subspecies) out of the equation because I didn't get to see them myself. I ran into that web page while doing an internet search and thought the same thing about it appearing more like Bell's than the widespread interior birds that occur further east. That form is also depicted in the Nat Geo guide along with "Bell's" and "interior." 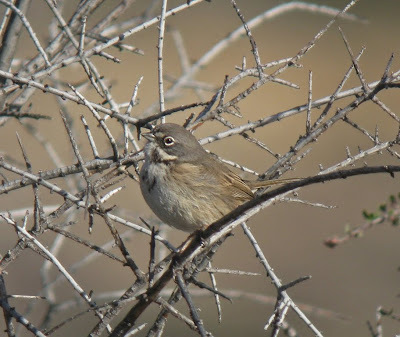 Sage Sparrows are great...wish we got them as vagrants in the east! Seeing them side by side like that really helps a novice like me. Interesting! !